— Since David, people have wanted to box God in and assign God a physical place to live. God is bigger than that and lives within us. All shrines and houses built to God are our plans, not God’s plans, and they are only good if they serve God’s purposes. People are bonkers about finding the perfect dwelling place for themselves and their family. Houses, along with cars and vacations are major symbols of status in our culture. And so, people tend to put a lot of their energy and time into the physical space in which they live. It becomes almost and extension of themselves. It becomes linked to their sense of security and self-worth. In our scripture today, King David has decided to do an extreme makeover: home edition for God. There is only one major problem. God never asked David to do it! Nor does it even seem like God cares that much. So what the heck is going on here? God cares about people and relationships. God is not interested in real estate. Our second scripture reading from Paul’s letter to the Ephesian church gives some serious insight into why God responded to David in the way that he did. It is because for God, Real Estate is meaningless. Instead, God cares more about Possessing the hearts and souls of people than God cares about land or buildings. To make it plain, God wants to build God’s holy temple out of people, not bricks and mortar. To keep going with this metaphor of a human temple, that’s why God sent Jesus to us, so that God could have access to more building materials to build God’s temple! God can now use ANY PERSON as a brick in the temple to build God’s family into a holy temple! God cares about people and relationships. God is not interested in real estate. If we understand and agree that God is primarily interested in reconciling people’s broken relationships with God, we can understand why God may have responded to King David the way God did in today’s scripture. First though, think about it from King David’s perspective. David had finally secured himself as the King. He had taken possession of the land that God wanted to give Israel. God had given David rest from his enemies. That’s how the passage opens. David, now was living in a luxurious palace made of giant cedar timbers imported from the north. No mud brick hut for this king! David was living the dream! And then he looked out the window of his luxury palace and he saw the tabernacle. All the flaps of the tent blowing in the wind. The dust and dirt on the ground as the floor. I don’t know what was going through his mind, but I suspect David was feeling guilty. David had achieved luxury and status, but God’s house was a drafty old tent. If I were David, I would want to do an extreme makeover on the tabernacle to build a super-cool temple for God! After all, that’s what you do, right? When God is with you, you build him a temple to make sure God feels welcome to stick around? Nope. God took major issue with David’s thinking. It was too worldly. David wasn’t even consulting God. Nathan even was like, yeah David go for it, clearly God is with you! Well, how would you feel if I won the lottery, and then moved into a mansion. Then, since we are friends, I went ahead and paid for an extreme makeover home edition for your house without even asking permission? Unless you are extremely unhappy with where you live, you would probably be mad! I would be mad if I came home, and my house had been turned into a mansion with a bowling alley and a swimming pool! After all, who is going to clean those things and fix them when they break? ME. The house that God is going to establish for David, is his extended family! The same extended family that God is building into a holy temple! Yes, God is going to let Solomon build a temple in Jerusalem, but clearly, God is not very interested in real estate or he would not have destroyed the temple. Twice. I think that is why God’s original location among the people was a moveable tabernacle made out of tents. God was more interested in being with people wherever they go than in real-estate. And thank God! Praise God that God cares more about each of us than about some building somewhere! God’s love for us is a relational love. It isn’t based on us maintaining a physical shrine for God. No matter where we are, God is present. In fact Jesus promises in Matthew 18:20 that, “where two or three gather in my name, there am I with them.” God cares about people and relationships. God is not interested in real estate. This one fact about God, shows us how deeply God loves each of us, and desires to be in a relationship with us! No matter how un-loveable we may be. Remember, The King David of scripture was a murderer and a mercenary. David is not an easy person to love based on his decisions. But God loves him! And that means God loves us, because we can’t possibly be as bad as David. I am willing to bet there are very few mercenaries in this room! If you are one, don’t tell me, I don’t want to know. God wants to build up God’s family by including anyone in the family through faith in Jesus Christ! That’s God’s passion, not real estate. There are some important applications that come from this message from scripture. There are applications both for us as individuals, and as a congregation. For individuals, the application is to put more emphasis on relationships than real estate in our lives. In our culture, buildings and property might be important and our houses may be status symbols. But if God cares more about relationships than real-estate perhaps we should too. But the trend in America is exactly the opposite. According to data I collected from the U.S. Census Bureau, The median house size in America has gone from 1,595 sf in 1985 to 2,426 in 2017! At the same time, the average household size has gone from 3.29 people in 1980 to 3.14 people in 2017. That means American families are getting smaller, but American houses are getting bigger. What if all those extra resources that went into building and maintaining larger homes for fewer people were used instead to intentionally build relationships in the Kingdom of God. I’m not even talking about what if all that money went to the church. That would be nice, but I mean what if people took that extra income spent on real estate and spent it on creating and improving their relationships with God and with other people? As believers in Jesus, we are encouraged to have the same priorities that Jesus has. Philippians 2:5 states, “In your relationships with one another, have the same mindset as Christ Jesus.” So the first lesson for us individually is to make sure that we are more interested in relationships than we are about real estate. Living in smaller, more affordable housing is a great way for individuals to apply this lesson. There are several social trends going on right now that might be worth checking out. The first is the “tiny house” movement. The second is the “van life” movement. For congregations, the application is to always view real estate as a means to an end and nothing more. This is a hard message for many people to hear. Mainly because we love the elaborate houses we build for God. We call them “churches.” In this congregation alone, I have heard many folks say they would rather die than worship God in another building! It is easy to fall into the trap of thinking that a church building is something special. The message from scripture is that God doesn’t need a building. WE are God’s temple. That is, the family of believers in Jesus. Any building, ministry center, or worship meeting house we construct is just that. The practical application is that the building a congregation rents or owns should always serve as a means to tell people about Jesus and to worship God. The church building ought never become the end goal. When a congregation is straining itself to support a building that is too large, that seems like a direct violation of God’s idea that relationships are more important than real-estate. It is clear from how God responds to David that God is not interested in real-estate. People and their relationships are God’s main things. It is also clear from Paul’s teaching to the Ephesians, that church is never a building. Church is always a people. Any you an I, we are part of God’s temple through our relationship with Jesus. As Paul teaches, “And in him you too are being built together to become a dwelling in which God lives by his Spirit.” WE are God’s building! God cares about people and relationships. 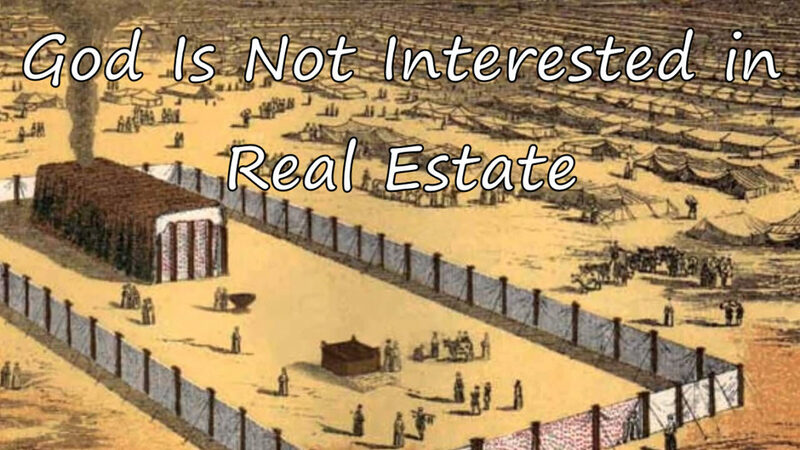 God is not interested in real estate.